Australia 9-237 declared and 2-74 (Ed Cowan 26*, David Warner 26, Ravichandran Ashwin 2-42) trails India 503 (Cheteshwar Pujara 204, Murali Vijay 167, Glenn Maxwell 4-127) by 192 runs. The Kangaroos managed 237 runs after losing 9 wickets when Michael Clarke declared their first innings and scored 2-74 off 32 overs in the second. India hammered 503 runs in the first innings after utilising 154.1 overs. The third day’s play concluded on Monday, March 4, 2013, at Rajiv Gandhi International Stadium, Uppal, Hyderabad. Earlier, India started the day at a solid position after they had smashed 311 runs in 93 overs for the loss of just one wicket on day two. Murali Vijay and Cheteshwar Pujara were unbeaten for 129 and 162 runs respectively. The batsmen got off to a slow start and scored just five runs in the first four overs as Vijay hit the first four of the day in the next over followed by another two in the 101st over. 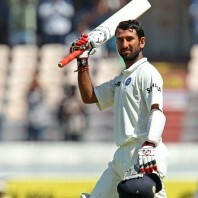 He achieved his Test career’s maiden 150 six overs later as Pujara kept on cruising from his end. The pair took the score to 393 in 120.4 overs when the Kangaroos dislodged the partnership. Murali Vijay was caught by Ed Cowan at backward short leg off Glenn Maxwell for 167 from 361 balls with 2 sixes and 23 fours. 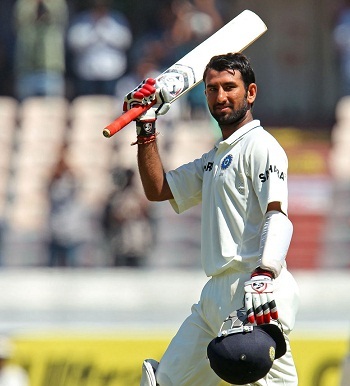 Cheteshwar Pujara thrashed his second double hundred but was gone for 204 off 341 with 1 six and 30 fours. Sachin Tendulkar lost his wicket cheaply for seven runs as the Indian skipper, MS Dhoni, and Virat Kohli got together in the center. Dhoni hit 3 back to back fours in the 126th over and Kohli scored just seven runs off the first 38 balls he faced. 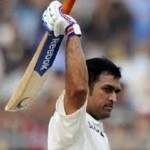 Dhoni was in an aggressive mood and added another 5 fours in the following overs and became the fifth victim at 460 at his personal contribution of 44 scored off 43 with 8 fours. Virat Kohli scored 34 runs as the entire Indian team was bowled out for 503 in 154.1 overs. The visiting spinners, Glenn Maxwell and Xavier Doherty were the most successful bowlers with 4 and 3 wickets accordingly, James Pattinson held two whereas Peter Siddle claimed one wicket. 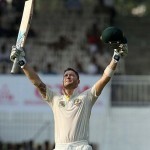 Ed Cowan and David Warner opened the second innings for Australia in a commanding way as the latter hit 3 fours in the second over off Ravichandran Ashwin. Warner was dropped at 13 by Kohli on the second ball of the fifth over at Gully off Bhuvneshwar Kumar and Cowan got a life at 0 when his catch was not accepted by Dhoni off Kumar again two overs later. Both batsmen survived a few leg before wicket appeals and the first fifty of the innings appeared on board in the 16th over with a six from Warner. The hosts got the first breakthrough when Ashwin destroyed the wood of Warner for 26 runs on the last delivery of the 20th over. The first wicket fell at 56 as Phillip Hughes joined with Cowan and they were unable to add any run in the next three overs. Phillip Hughes was clean bowled by Ashwin on the third ball of the 24th over for a duck and Shane Watson replaced him at the crease. The Aussies reached 74 without losing any further wicket in 32 overs when the play was called off on the third day. Ed Cowan was at the wicket for a hard fought knock of 26 off 100 deliveries whereas Shane Watson scored 9 runs. Australia is still 192 runs behind the first innings total of India and keeping in view the dangerous form of the home spinners, the match may come to an end on the fourth day.